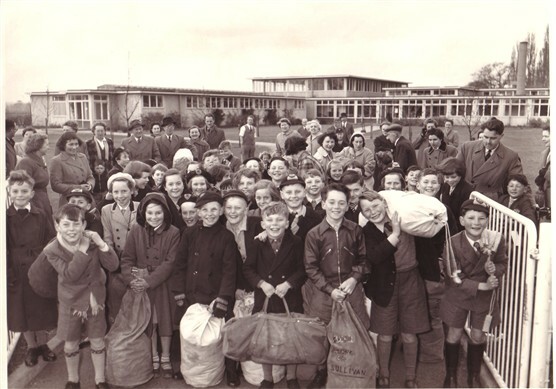 Here pictured at Morgan’s Walk School gates in 1956 are many happy faces off to Cuffley Camp for a week under canvas, and for many, their first time away from home without their parents. Accompanied by two teachers, Miss Petch (Mrs Stevenson) and Mr Collins. A good time was had by all. I went to Cuffley Camp when I was at Wilshire Dacre School, Hitchin, in 1954.I had told my mum not to write to me in case I got homesick, however, when I saw letters from other parents, I was so homesick that I cried in my tent. The teacher, Mr Tapson, somehow arranged for me to phone my dad who was a GPO telephonist, and shortly afterwards I received a parcel with a letter, chocolate cup cakes and new socks. We were allowed a midnight feast with the cakes and my homesickness disappeared. We sang a camp fire song ‘Down at Cuffley under canvas home is many miles away etc’ I took all my gear in an old army kitbag. I remember Cufley Camp with very fond memories it was the first time I was away from my family. I was at How Wood Junior school in Park Street St.albans (44 years ago) and my group were put in Hilltop which was funnily enough right at the top a hill. We slept on Pally-asses and had to roll up the sides of the tents each morning. I will never forget the experience and lovely memories and so glad to see that it is still going strong all these years. I found my “Welcome to Camp” booklet. The Villages were Justice Hill, Nether Wychwood, Hill Top, Grimeset, Brackendene and Birchester. Looking at the photo above I note the lack of what today we call camping and outdoor clothing. We survived though! I went through family photos of my own and found one of my mother pouring tea into a China cup from a teapot covered with a tea cosy! Not out of place at home of course but camping by the Thames while dad was fishing, how British! I went to Cuffley Camp with Burleigh School, Cheshunt. It was in my last year, so that would have been 1965. I remember having a great time, though not a lot of detail apart from that we were in “Nether Wichwood” (I think that was the spelling). I went to Cuffley Camp in 1960 when I was 10. I went with Crowley Hill school, Boreham Wood. I lived in Well End. We had a fantastic time as did my sister two years previously. Most of the Hertfordshire primary schools sent their final year pupils. The efforts of the school teachers and camp staff is to be applauded. Fell in love with Avril Kemp there! She was from Brookmans Park. Smokey beans (I can still taste them! ), spookey songs around a bright bonfire in the dark of the night, damp tents, nature rambles – identifying trees and leaves, cleaning duties, froggy bogs. Great time.